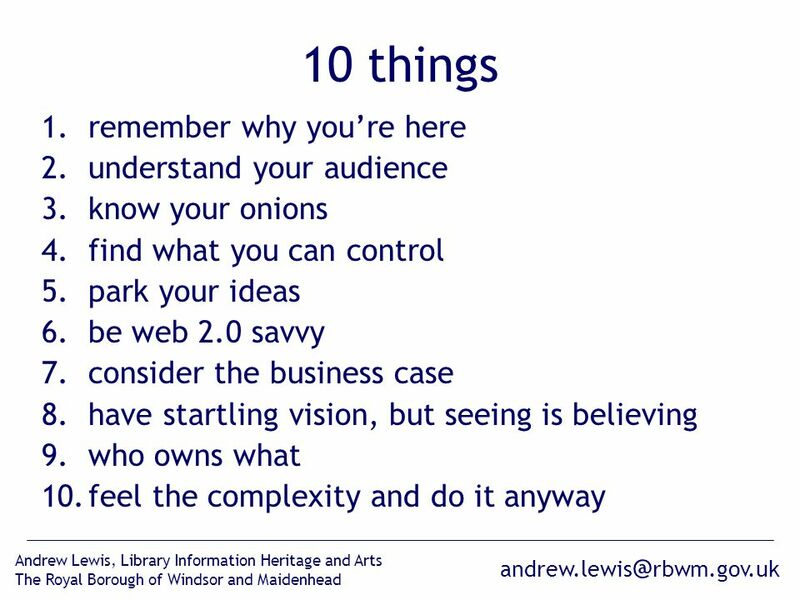 rbwm.gov.uk Andrew Lewis, Library Information Heritage and Arts The Royal Borough of Windsor and Maidenhead Andrew Lewis 10 handy things. 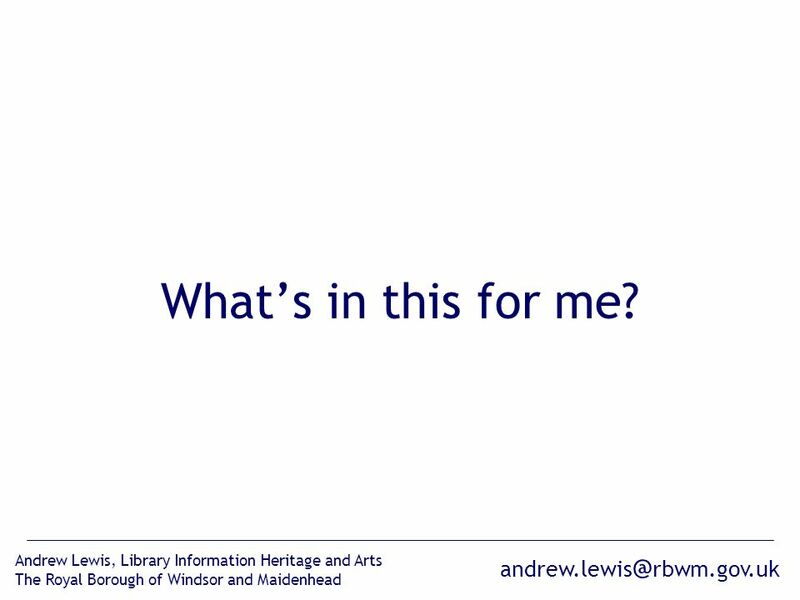 2 andrew.lewis @ rbwm.gov.uk Andrew Lewis, Library Information Heritage and Arts The Royal Borough of Windsor and Maidenhead What’s in this for me? 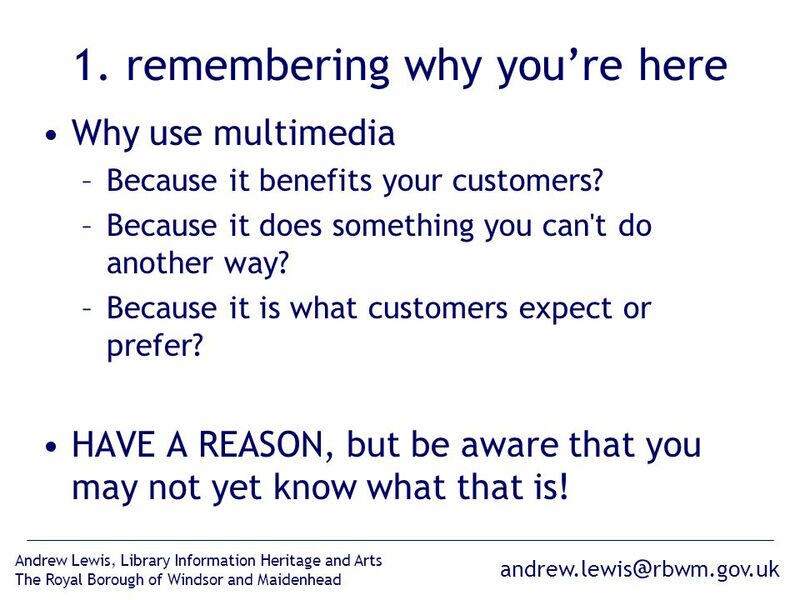 6 andrew.lewis @ rbwm.gov.uk Andrew Lewis, Library Information Heritage and Arts The Royal Borough of Windsor and Maidenhead 1. remembering why you’re here Why use multimedia –Because it benefits your customers? 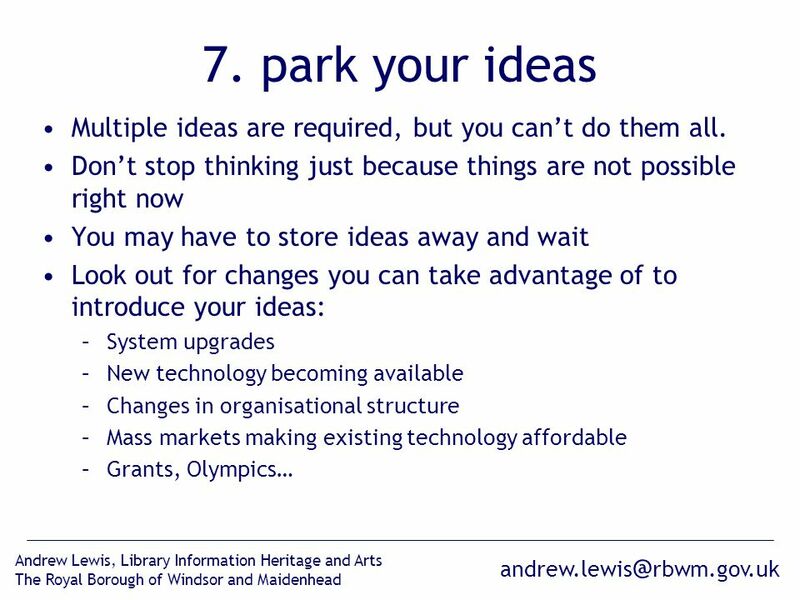 –Because it does something you can't do another way? 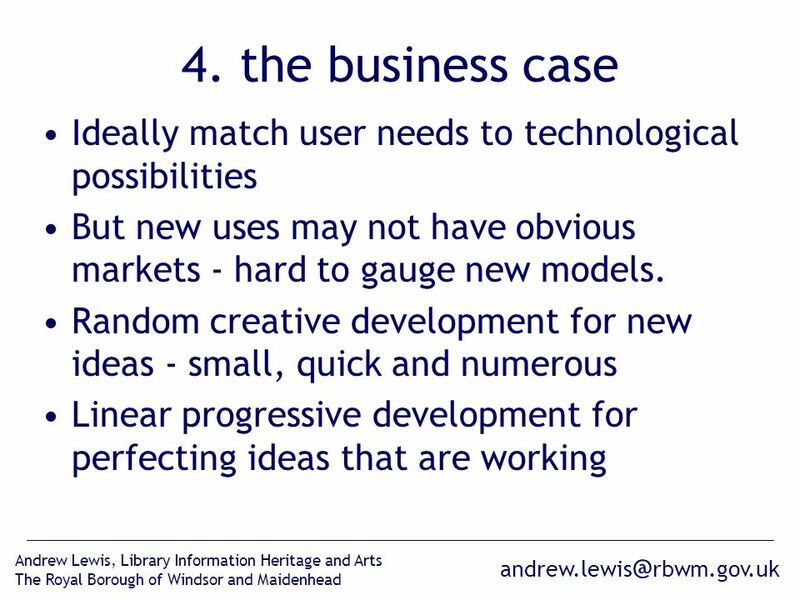 –Because it is what customers expect or prefer? HAVE A REASON, but be aware that you may not yet know what that is! 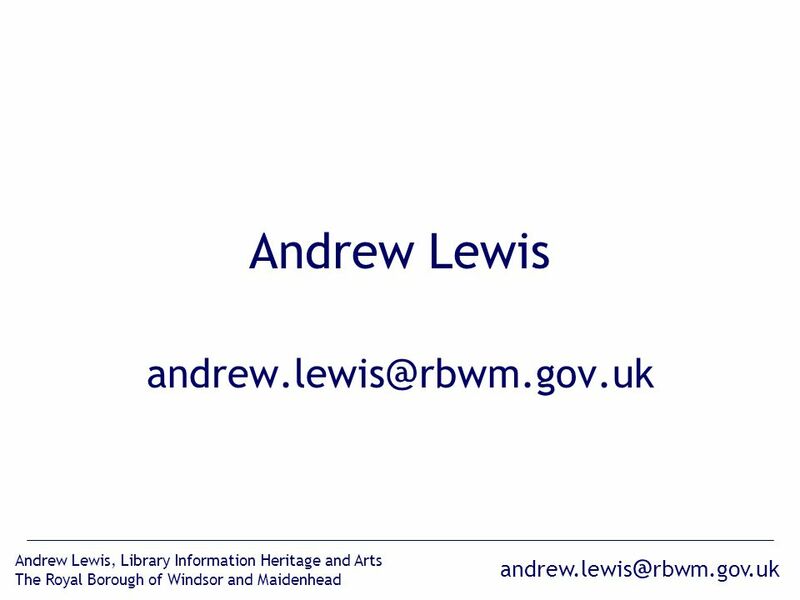 15 andrew.lewis @ rbwm.gov.uk Andrew Lewis, Library Information Heritage and Arts The Royal Borough of Windsor and Maidenhead 10. 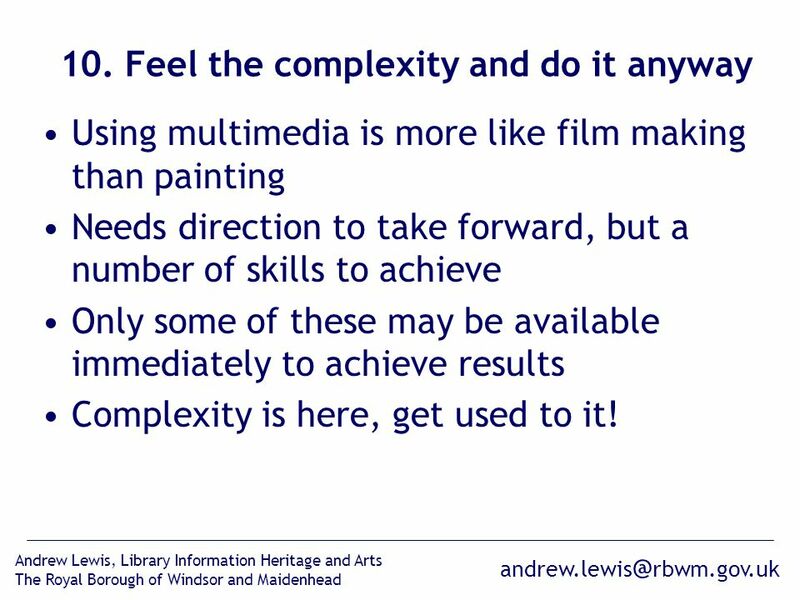 Feel the complexity and do it anyway Using multimedia is more like film making than painting Needs direction to take forward, but a number of skills to achieve Only some of these may be available immediately to achieve results Complexity is here, get used to it! 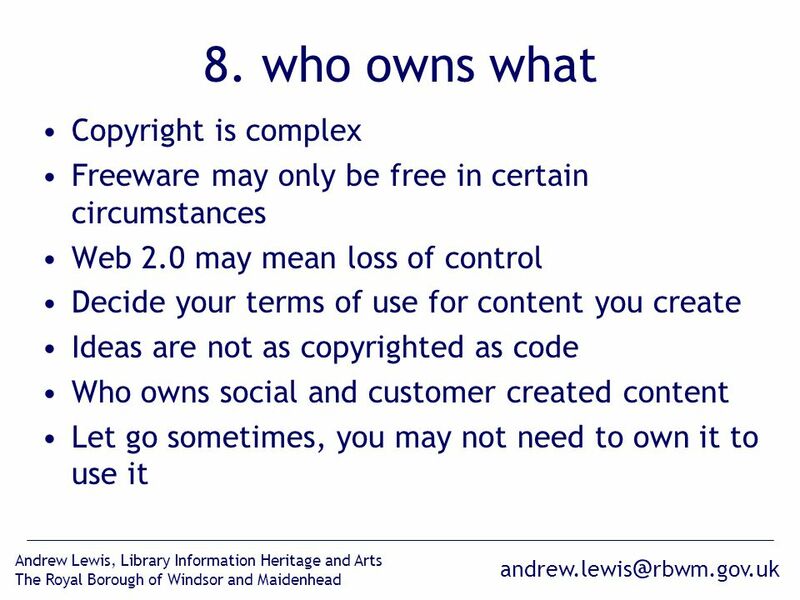 16 andrew.lewis @ rbwm.gov.uk Andrew Lewis, Library Information Heritage and Arts The Royal Borough of Windsor and Maidenhead OK, so exactly what is he talking about? 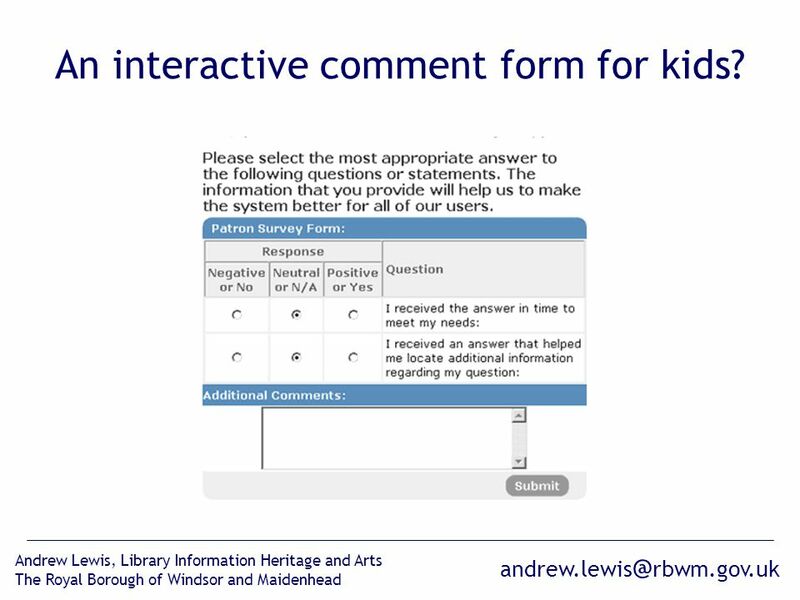 17 andrew.lewis @ rbwm.gov.uk Andrew Lewis, Library Information Heritage and Arts The Royal Borough of Windsor and Maidenhead An interactive comment form for kids? 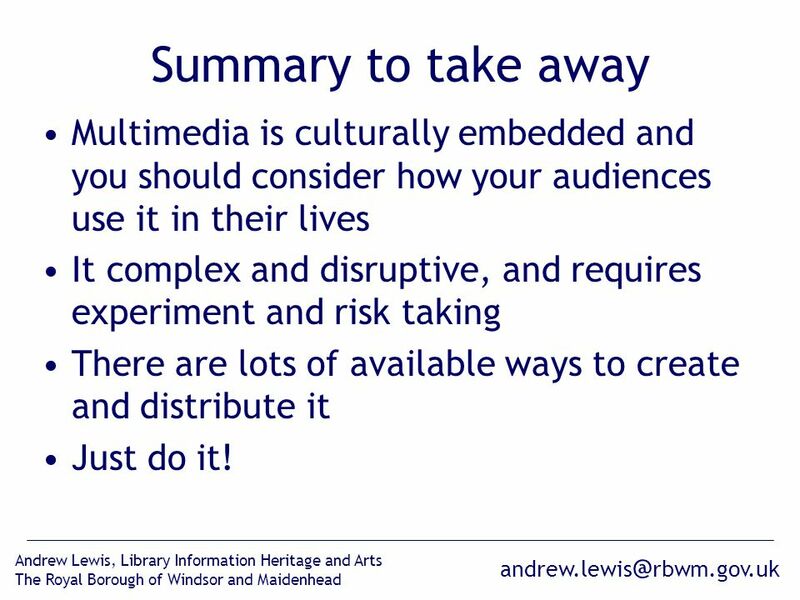 20 andrew.lewis @ rbwm.gov.uk Andrew Lewis, Library Information Heritage and Arts The Royal Borough of Windsor and Maidenhead Summary to take away Multimedia is culturally embedded and you should consider how your audiences use it in their lives It complex and disruptive, and requires experiment and risk taking There are lots of available ways to create and distribute it Just do it! 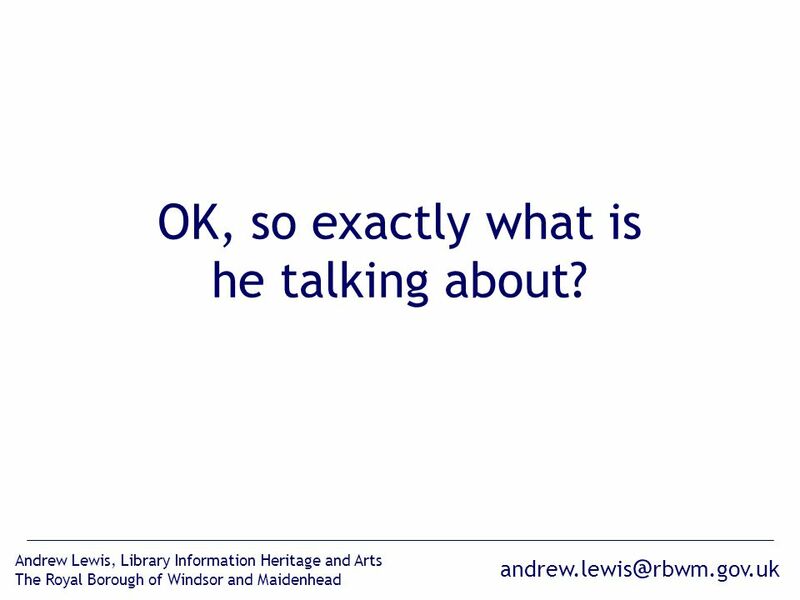 Download ppt "rbwm.gov.uk Andrew Lewis, Library Information Heritage and Arts The Royal Borough of Windsor and Maidenhead Andrew Lewis 10 handy things." 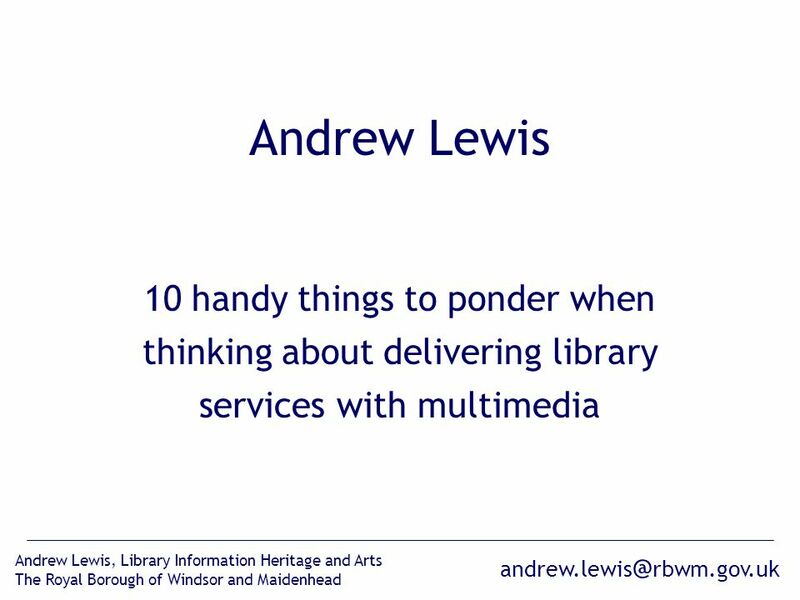 Practical experiences of planning and delivering library e-services in The Royal Borough of Windsor and Maidenhead UKOLN Public. 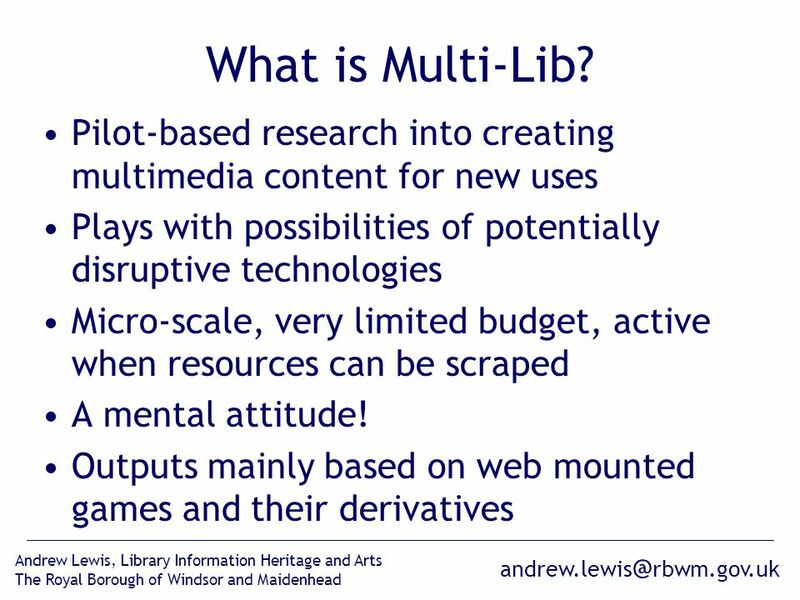 Learning at Our primary role has been to help schools, teachers and lifelong learners engage with NLS collections through online resources, workshops and. © All materials are copyrighted by KarateBuilt L.L.C.. No unauthorized use is permitted. - Program Revision 5.1 The Phone Script The First Job Inside the. 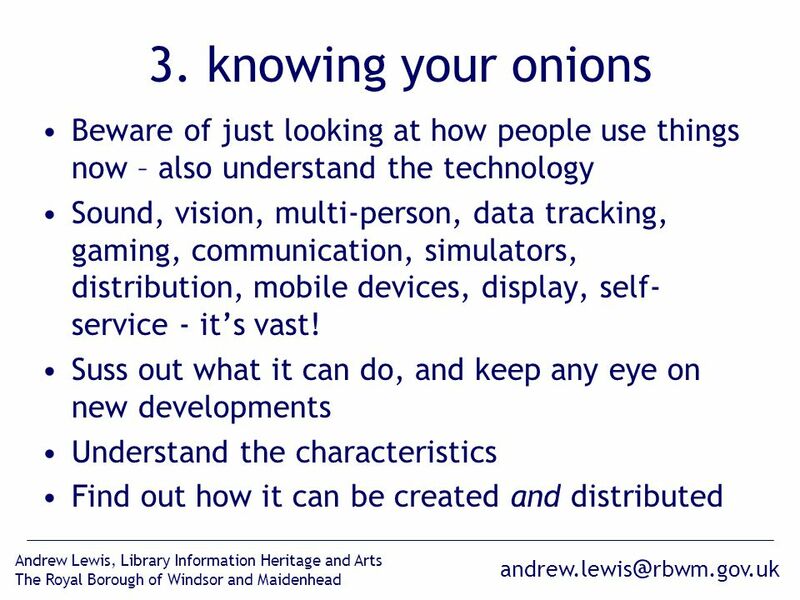 Shock, Horror, Computer Games are good for public libraries Andrew Lewis, e-Services Officer Library and Information Services The Royal Borough of Windsor. 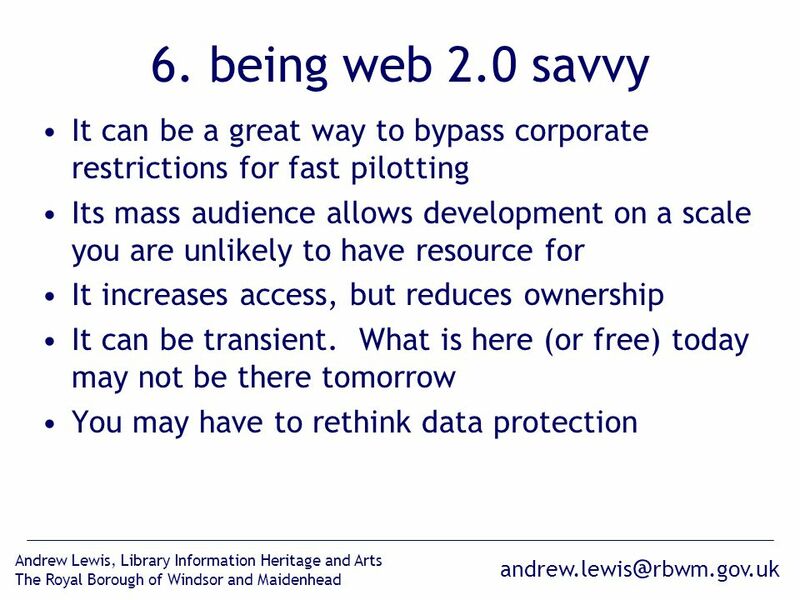 It’s Not the Technology It’s the Learning Professional Development September :00. 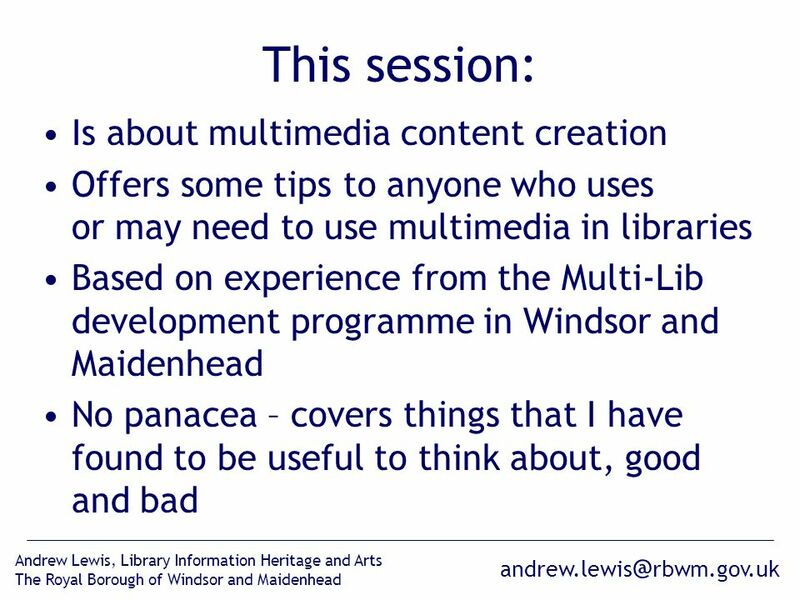 DIY game-based multimedia in your library Is it for you? 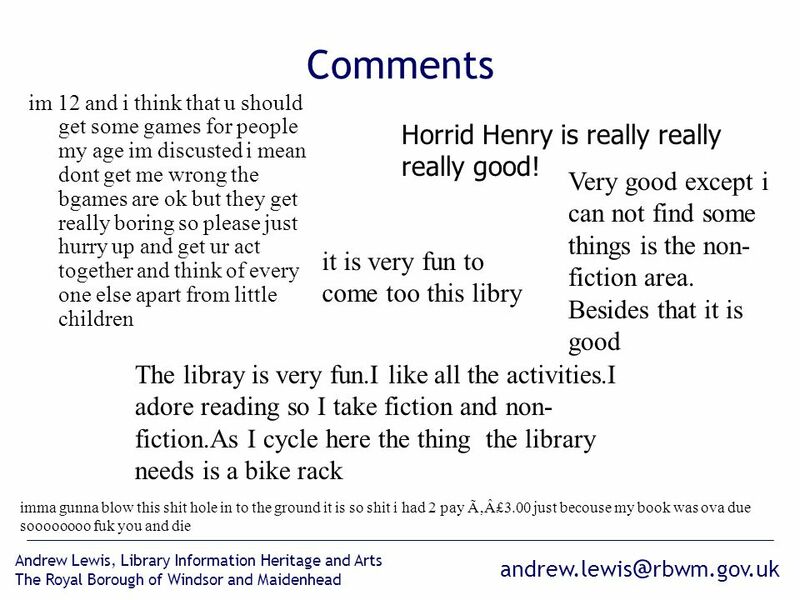 Library and Information Services The Royal Borough of Windsor. 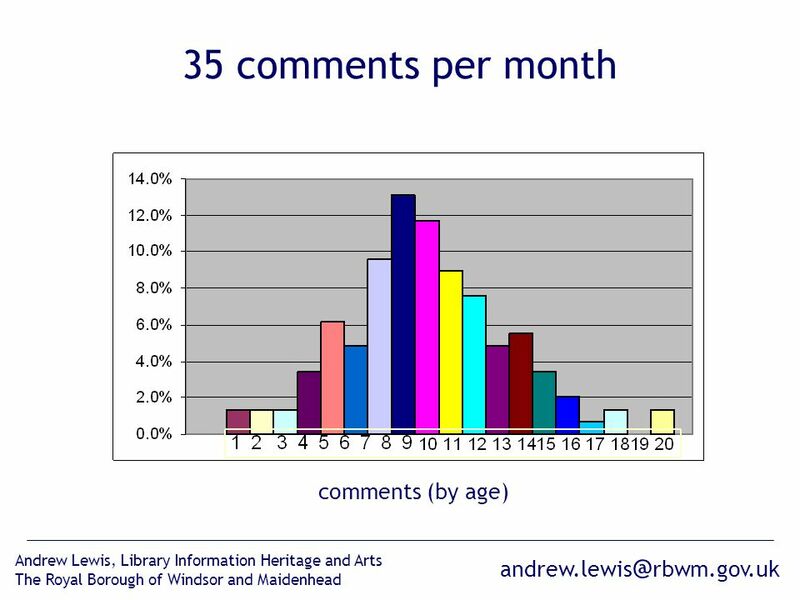 The Royal Borough of Windsor & Maidenhead Social Media Activity. Logs and Blogs. What is a reflective log? A record of your learning experiences, thoughts, feelings and reflections Not just a diary of what you have. 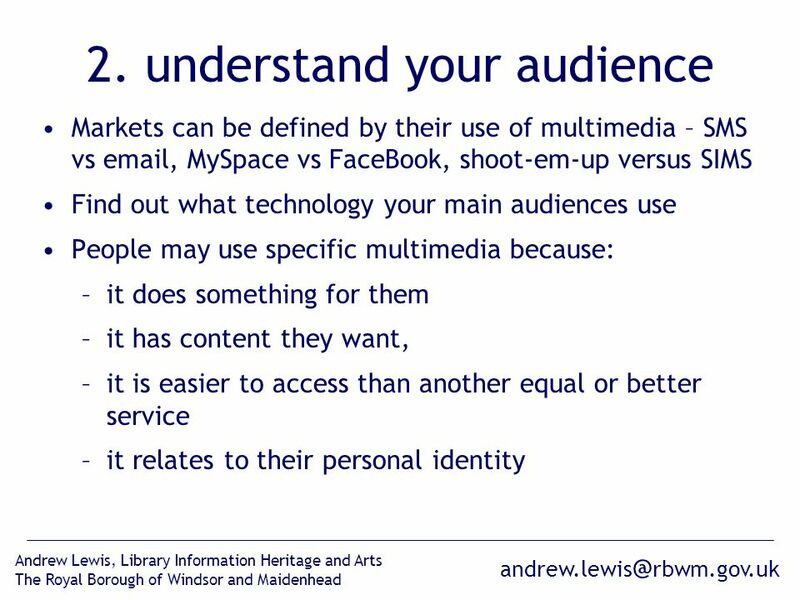 Cyberbullying When good technology goes bad…….. Stay safe in cyberspace. 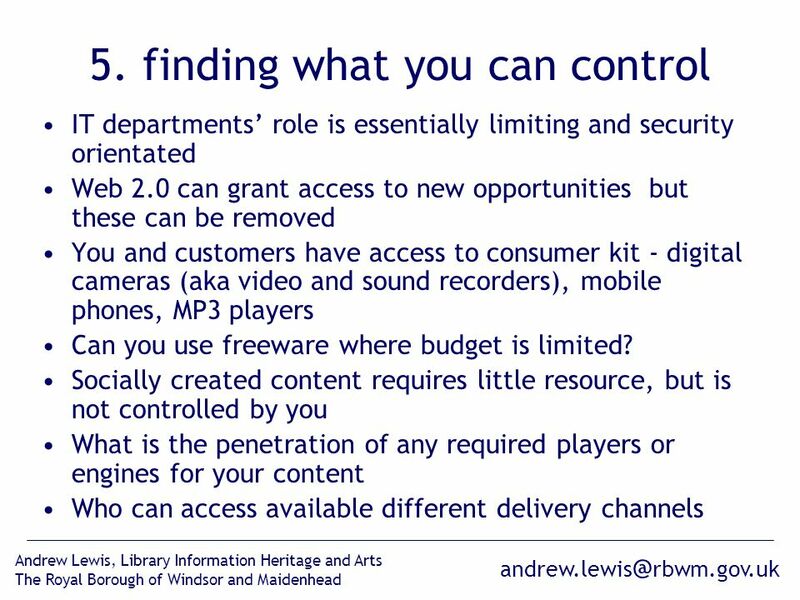 A look at interrupts What are interrupts and why are they needed in an embedded system? 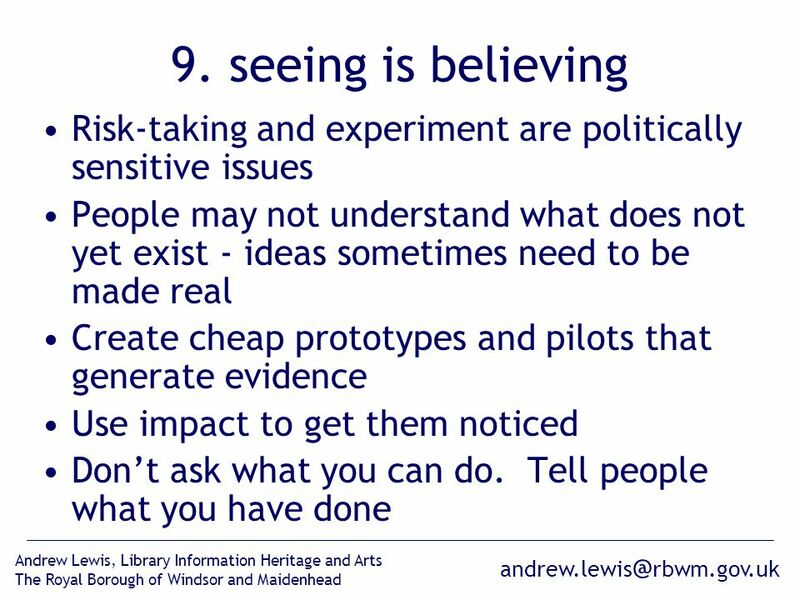 Equally as important – how are these ideas handled on the Blackfin. Social Media Staying one step ahead of your children!! 1 A Student Optics Workshop Hwa Chong Institution, Singapore November 15th, 2012 An Exploration of Nifty Portable Dental and Medical Imaging Techniques.